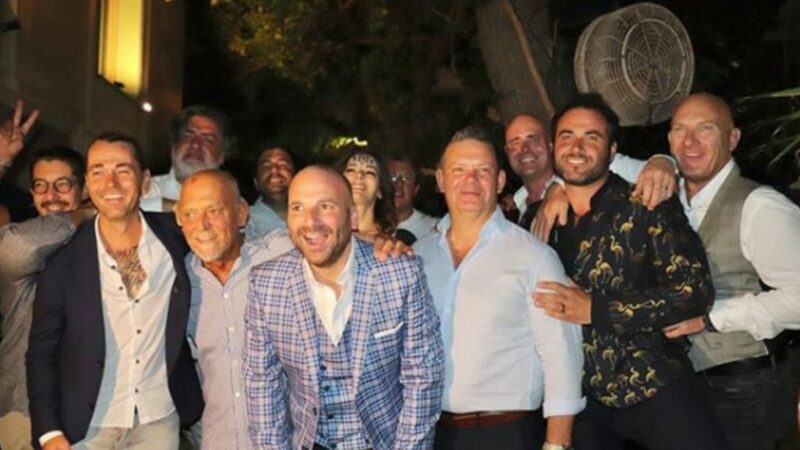 Australia’s most popular Greek-Cypriot chef George Calombaris has finally married his partner of 11 years Natalie Tricarico in a luscious ceremony in Greece. Even though the couple has refrained from sharing photos from the wedding on social media, several esteemed guests posted beautiful images from the biggest reception Athens has seen in a long time. The wedding was held at the Island Athens Riviera, a prominent seaside venue overlooking the Saronic Gulf. Best man was Theo Kanatas from Melbourne, a good and long time friend and colleague of the Masterchef judge. Both Calombaris and Tricarico have one divorce behind them and two children together James, seven, and Michaela, five. Celebrity chefs the likes of Nigella Lawson, Shannon Bennett, Manu Feildel, Alastair McLeod and Matt Moran were all there as well as Calombaris’ Masterchef buddies Matt Preston and Gary Mehigan. Greece’s tfavourite pastry chef Stelios Parliaros and culinary expert Christoforos Peskias were among the guests, alongside Greek music singer Giorgos Tsalikis and rapper Stan. Can you tell where the new Dolce & Gabbana SS‘18 campaign is set?